You may want to consider a Gift Card this Christmas. 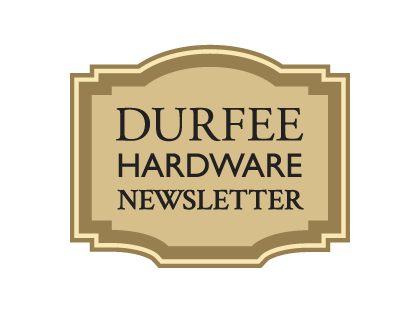 At Durfee’s, we would like to continue serving you better, so if there are any items that you would like to see us stock, please let us know. One recent example was a request for bicycle tire tubes in stock. You can now find them right by the front door! I realized I had a dead tree that could end up falling on my garage, so last weekend I got my axe out. Yes, I do have a chain saw, but I grabbed the axe anyway. One reason for this is that I like to hear when the tree is starting to crack; I guess I feel safer that way. The other reason is that my Dad generally used hand tools a lot. I think it’s a generational thing. My generation started exercising and going to the gym. I can remember my Dad saying that he got his exercise working around the house and, I think, he thought that the idea of a gym was stupid. Chopping that tree down reminded me of him. I remember him handing me a splitting maul and telling me to split some wood. I made a face and he told me it was good exercise. Well, I will say, he is right about this lumberjack work. Chopping that tree down certainly burns some calories. I continue to have some painting and caulking to do around the house. I trimmed a bunch of trees with the pole saw that was my Dad’s (he extended it with a length of aluminum tubing so it would go much higher). I also chopped that tree down. That last storm brought a couple of large branches down, so I got out the chain saw and chopped them up as well. Did you know that we sell pre-mixed gas for chain saws? The mix does not contain ethanol, which will make your chainsaw happy. I am embarrassed to say that one of the tiles I laid down several years ago, cracked. I think that I must not have pushed the corner down properly into the mortar, so it wasn’t being supported by anything. When I moved the foot of a chair on top of it, there was a crack. Fortunately, I always save whatever is extra from jobs like that. If you use a contractor for any renovation work, I would highly suggest asking them to leave the extras for you as well. So I used the diamond blade I bought and made several cuts through the tile so that I could take it out of the floor in pieces without cracking the other tiles. It came out nicely. Then I found the extra grout that I had saved as well. When I was done, my wife could not tell which tile I had replaced!! I do want to mention that, with the weather we have been having, the grass I planted last month came up wonderfully.